We are an approved Texas Department of Insurance education provider (Provider ID# 98057). 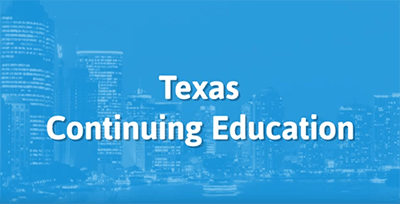 Is it time to complete your continuing education credits to maintain your Texas insurance producer's license? Instead of spending your Saturday sitting in a classroom, why not try completing your courses online? AYPO offers a variety of packages to suit your CE needs, and you can take your classes anywhere, anytime, At Your Pace Online. Insurance Licensees & Adjusters are are required to obtain 24 hours of continuing education before the expiration date of their license. 2 of the 24 hours required must be on the topic of Ethics, however the remaining 22 hours can be taken on any approved insurance topic. Half of your CE requirement can only be met by classroom or classroom equivalent courses. Our classroom equivalent courses meet this requirement and are still 100% online and at your own pace. This course provides 12 hours of Property & Casualty Classroom Equivalent Continuing Education! It includes 2 Hours of Ethics and 10 Hours of continuing education on Property & Casualty topics. Course fee includes the mandatory $0.75/hr filing fee. This course provides 12 hours Classroom Equivalent CE! It will review key concepts and principles of Life & Health insurance. It includes 2 Hours of Ethics & 10 hours of continuing education content and the mandatory exam. Together with our 12-hour Life & Health class, this will satisfy your 24 hours CE requirement. No additional reporting fees! This course provides 12 hours of CE! It will review key concepts and principles of Property & Casualty insurance, and includes 12 hours of continuing education content and the mandatory exam. No additional reporting fees! Note: This course does not include Ethics! This 3 Hour course will meet your one time Certification Requirements to start selling Flood Insurance in the state of Texas. No additional reporting fees! This course provides 12 hours of CE! This course will review key concepts and principles of Life & Health insurance. It includes 12 hours of continuing education content and the mandatory exam. The course titled 12 Hour Property and Casualty Review Part 2 is certified for insurance licensee continuing education (CE). The course is valid for a periodf beginning 09/28/2017 and expiring 9/28/2019. The course is valid for two uyears as long as your provider registration remains active. NOTE: Excess of Ethics or Consumer Protection hours over licensee's requirement is counted as general hours. Adjuster pre-license credit may NOT be used for CE credit. The course titled 12 Hour Life and Health Review Part 2 is certified for insurance licensee continuing education (CE). The course is valid for a periodf beginning 09/28/2017 and expiring 9/28/2019. The course is valid for two uyears as long as your provider registration remains active.